Myron, a truck driver, delivered bricks to Wright-Patterson AFB in Ohio, right after the famous December 9, 1965, crash of an unidentified object in Kecksburg, Pennsylvania. Myron described a strange bell-shaped object he saw in a USAF garage that was“entombed” in brick. 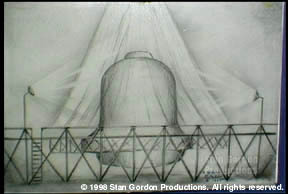 Drawing by Charles Hanna © 1998 by Stan Gordon Productions. Updated August 6, 2004 - In 2002, former President Bill Clinton's Chief of Staff, John Podesta, joined the Sci-Fi Channel in a request to NASA to release all documents it has on the Kecksburg, Pennsylvania “UFO crash” of December 9, 1965.